Running at this time of year can be a cold, wet, unforgiving business, and it can be all too easy to sacrifice a run in favour of staying inside in the warm and dry. But there is really no need for that. Gloves, hats and jackets are all available to help you stay as warm and dry as you feel you need to. Nike has a range of equipment to meet these needs, and its new 2011 season range for women includes the Nike Vapor Lite Women’s Running Jacket. As its name suggests, this is an incredibly light jacket. The microfibre polyester material feels very flimsy in the hand, but it is not, in fact, a flimsy item. I think it would take a serious snag to make a hole in the fabric – much more than you are likely to encounter on a standard training run. The jacket comes in several colours – red, blue, pink, white and the bright yellow I was sent. Each jacket has a pattern of small black dots on it which relieves the tedium of the main colour. I think the yellow is a great choice for wearing at night, though there is very little reflective content with just a small amount of piping here and there, including a narrow stripe on the back and a very discrete Nike swoosh on the upper left front. I’d have liked a bit more reflective material. There is a pocket on the right side which is fixed so that it sits on the back of the jacket, effectively nestling in the small of your back. It is large enough to accommodate a mobile phone easily and could also take a pair of gloves and/or a hat if you’ve started a run with these and taken them off as you’ve warmed up. I found I didn’t use the pocket though, as anything put into it jiggled about rather too much for me. It is certainly not appropriate for carrying your keys unless you are a real fan of the clinking noise they make as they move around in the pocket, and don’t mind them hitting against your body with every step you take. The pocket has another, really useful role, and this is arguably its key function. You can pack the jacket into it for storage and transportation. It would just about fit into a small bumbag when packed down, which means you could take the jacket on a long run when the weather looks iffy and pull it out if needed. There’s even a small airhole so that any residual odours can escape. 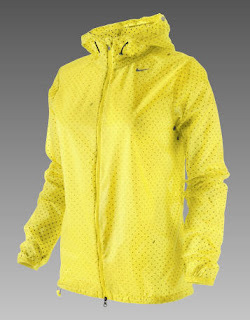 One of the things that really drew me to the Nike Vapor Lite Women’s Running Jacket was that it has a hood. Keeping your head warm is important and a hat is just another thing you have to take off and stow when you have warmed up after a very cold start. Unfortunately the hood does not pack into the jacket’s collar, but that’s the only bad thing I have to say about it, and being so very light I didn’t notice the hood flopping about as I ran. There are two securing bungee cords, one that tightens the hood around your face and another that pulls it in around the crown of your head. I found there was plenty of give around the neck so that there was no constriction looking left and right, and the fit was such that I wasn’t really aware the hood was on when I was using it. The lightweight material of the jacket is a factor here, but the cut and dual bungee system are clearly also important and have been well thought out. There is a bungee cord around the hem so you can draw the jacket in tightly around you to help get a really snug fit, and the back of the jacket is slightly longer than the front which helps stop it riding up as you run and helps ensure your backside stays covered. As you’d expect with a higher end technical jacket like this you can open the front zip in both directions so that if you’ve zipped the jacket up and want to get into a pocket in your running bottoms you can unzip it from the bottom to let in the least amount of cold air or rain. Nike provides a sizing chart at its web site so you can find the most appropriate fit. I found the jacket was not quite tight enough around my upper torso, and the arms were a little long, but I did like the body length which is longer than my usual running jacket. All of this is a matter of how well your own body shape matches the measurement on which Nike bases its sizing, of course, but you may want to find a store which will let you try the jacket on before you buy. Having said that, I didn’t find any of the fit niggles a particular issue, and the overall lightness of the jacket made it very comfortable to wear. During the testing period, with temperatures on various runs starting no lower than three degrees, I found all I needed to wear under the Nike Vapor Lite Women’s Running Jacket was a very light running top. There was no need for a thermal base layer even on the coldest of days, and I took the jacket off mid run on many occasions. This brings me neatly on to a word about the Dri-Fit fabric. Dri-Fit is a Nike technology that’s similar to other wicking systems, but it does a bit more than simply wicking. It takes sweat on a one way trip from the body to the fabric’s surface, and from there it can evaporate. Its great benefit is that sweat has a route away from your skin so you keep dry. There are other technologies that offer similar benefits. Now, this doesn’t mean you get back from a run as dry and fresh as when you started – but it does help reduce the amount of sweat that sits on your body surface. If you wear this kind of fabric and then a non-breathable one as a comparison you will really notice the difference. 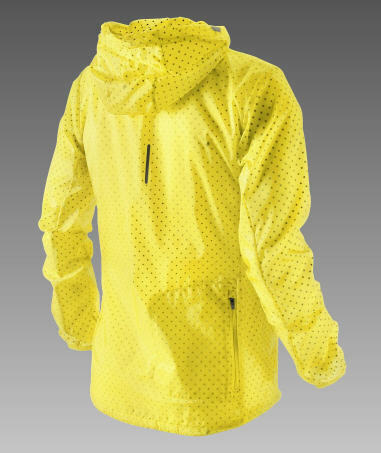 Something else you might be looking for in a running jacket is for it to provide a waterproof layer. You won’t get that from the Nike Vapor Lite Women’s Running Jacket. It is water resistant, and did a good job of keeping the rain out during the light showers I ran through during the testing period. But it won’t keep you dry if you are running through a raging thunderstorm. I found the Nike Vapor Lite Women’s Running Jacket a very comfortable and useful jacket. It is extremely light to wear, and the hood is particularly welcome, its twin toggles ensuring a snug fit. I’d have liked to be able to pack the hood into the collar when not in use, but on the other hand this facility would have added more bulk to the jacket, and as it is it packs down really nicely into its own pocket. A bit more reflective material would have been welcome for night time use, and for me the fit was not quite perfect. At £72 the Nike Vapor Lite Women’s Running Jacket is not an inexpensive item. And if you want a running jacket that will keep you bone dry in harsh conditions, you’ll need to look elsewhere. But as a wind resistant, showerproof outer layer that can keep you warm when it’s chilly out there, it could be the ideal spring gift to yourself.